Here are a few links that will aid you as you follow up on some of the mythological references in Pan’s Labyrinth. For a very detailed analysis, see the discussion of the movie here and here. 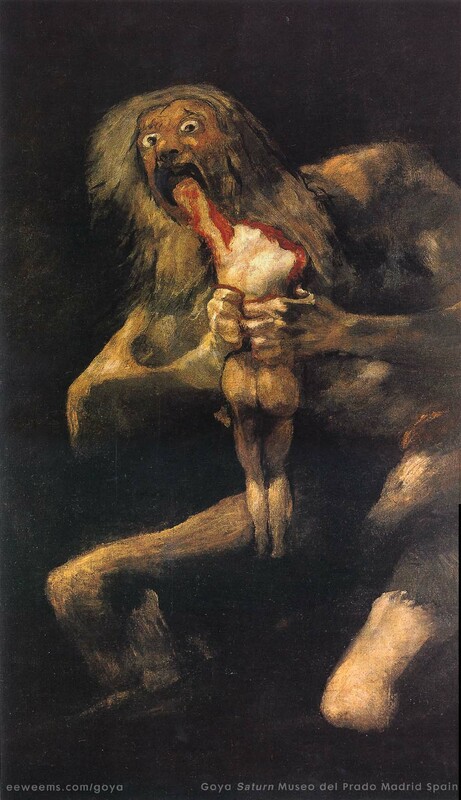 The image on the left is Francisco Goya‘s Saturn Devouring His Son. Saturn was the Roman name for the Greek god Cronos, father of Zeus. He ate his children for fear of being overthrown by them. (Question: how does this connect to the plot and themes of the movie?) A lengthy and interesting discussion of Goya and this painting can be read here. The young heroine of Pan’s Labyrinth is named Ofelia, and Ophelia is also, famously, a major character in Shakespeare’s Hamlet. Given the translation of the title, we can infer that the Faun character is a version of Pan, who was another character from Greek myth (though Pan was not the only faun). There are also certain similarities between Ofelia and Persephone, who was stolen by Hades, Greek god of the underworld. For some additional discussions of the movie, here are a few reviews and articles from the New York Times, Roger Ebert, and Wired magazine. This entry was posted in Blog Ideas and tagged Cronos, Goya, mythology, Pan, Pan's Labyrinth, Saturn. Bookmark the permalink.